With the start of every school year I find myself overwhelmed with how to organize everything. There are homework papers, classroom newsletters, school memos, fundraisers, party invitations, spelling words, etc etc etc. The list seems to be never-ending. 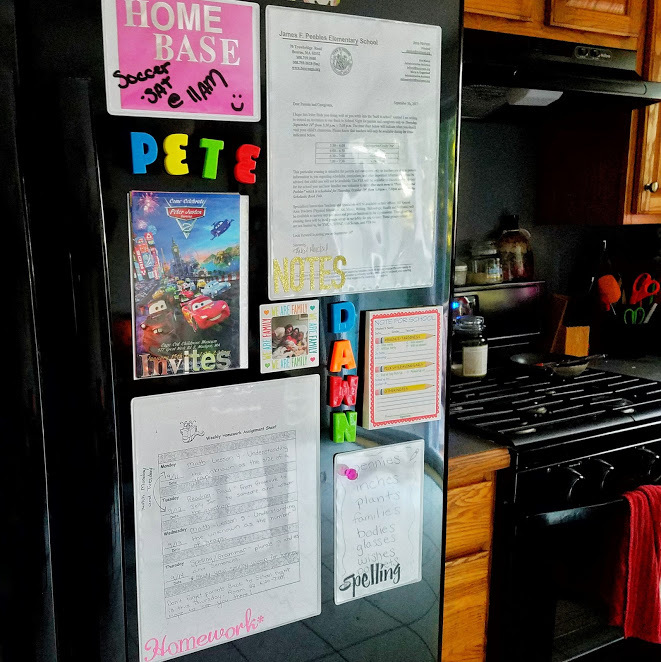 Over the summer I came up with the idea to use our fridge as our “home base” since that seems to be where everything ended up anyways. My next project was figuring out what tools Id need to make this work. After a trip to Target and lots of brainstorming, I have come up with a system that is really working for our family. #1 Notes from School. This is an 8.5×11 frame that holds any general notes about picture day, fundraising, etc. #2 Homework. 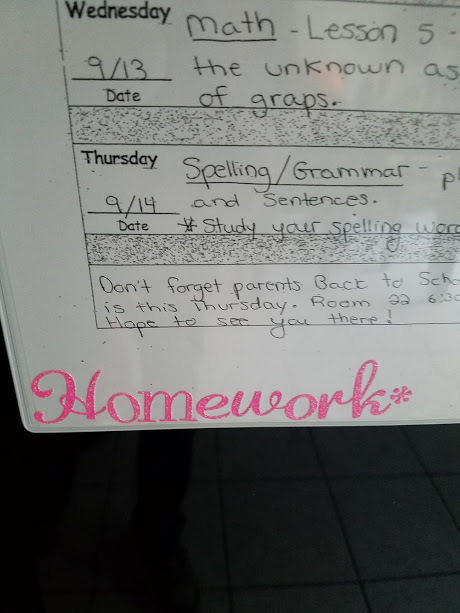 This is the 2nd 8.5×11 frame and it holds our weekly homework assignment sheet & a weekly checklist her teacher sends home. #3 Spelling Words. This is a 4×6 frame. Each Monday I write down her spelling words & put them in the frame to practice. 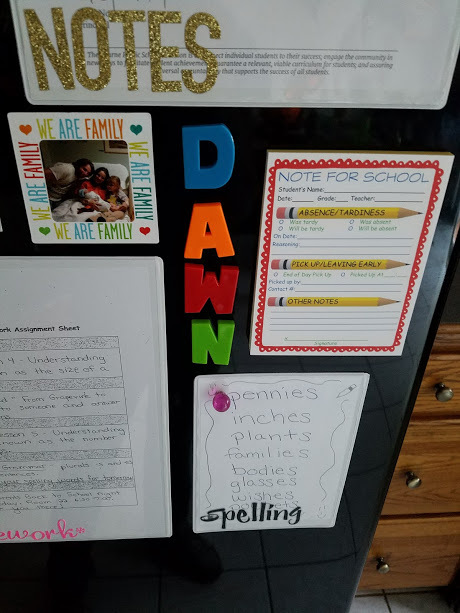 Our method of “continuous studying” means that every time she opens the fridge, she must say & spell a spelling word, then move her marking magnet down to the next one for the next turn. #4 Invites. This is the 2nd 4×6 frame and it holds any upcoming party invitations. Other fun features. 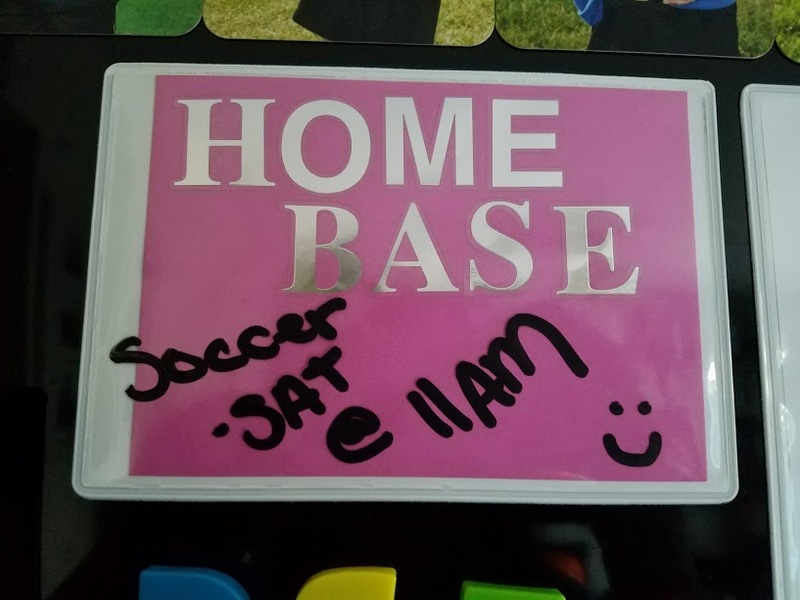 The “Home Base” and any other frame can also work as dry erase boards. I like to jot down any special messages for the next few days on the relevant section to make sure we remember. We also have a ColorfulCreationsCC Notes to school Magnet. This magnet makes morning notes so much easier! Each frame is decorated with some scrapbooking sticker letters to keep it labeled appropriately, we also added some fun magnets we had to make the whole this look more fun! this is super informative, thanks for putting this together! These are super creative ideas! I never would have thought to use a picture frame as a dry erase board! 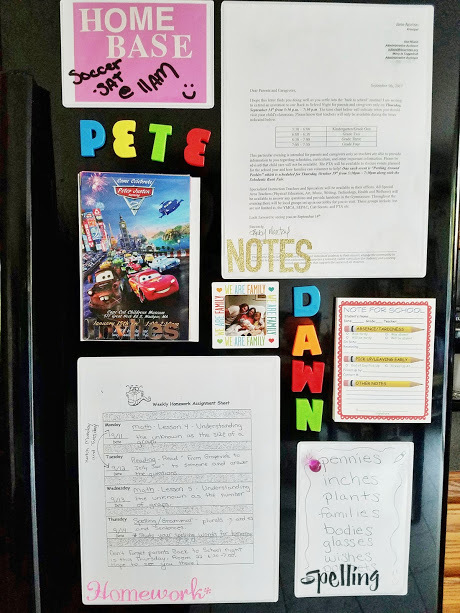 I really like the idea of keeping spelling words on the fridge, always in view. I also feel that keeping school papers in order is a daily battle, some days are better than others… Great post! That's a great idea to have a place for everything! This is such a great idea! I think that I would find something like this so useful when my kids are in school. So happy to hear that, it was so simple to put together but so effective! This is so smart! I’ll have to remember this for when Isla is school age!